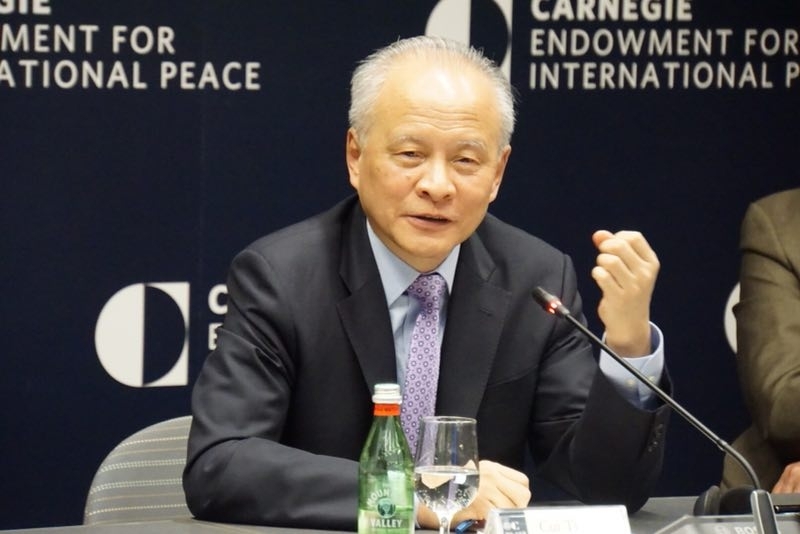 On July 25, Ambassador Cui Tiankai attended the Second Session of the 8th US-China Civil Dialogue hosted by the Carnegie Endowment for International Peace. The following is the full text of Ambassador Cui’s remarks. It is really a great pleasure and honor for me to come back to Carnegie and meet with so many old friends. I have noticed that the theme of the Dialogue today is “Navigating Through the Uncertainties in US-China Relations”. The word “navigating” reminds me of what was said by former Secretary of Treasury Tim Geithner at the opening ceremony of the first round of S&ED. He said, “we are actually in the same big boat that has been hit by fierce wind and huge waves”, which was at the time of the international financial crisis. Now nine years have passed, we are still faced with such fierce wind and huge waves. The world is still quite unstable and unsafe. We are still faced with terrorism and proliferation of weapons of mass destruction. We still have a number of regional conflicts going on. The relations between major countries have come to a crossroad. There are still lots of uncertainties. And of course, nobody can predict when the next financial crisis will come, the next outbreak of major epidemic, natural disaster, or even a war. We are still faced with such fierce wind and huge waves. But are we still in the same boat? I believe we are still in the same boat. We still live in this small global village, this planet of ours, unless someday we find a way to send people onto the Mars. But there are those who believe we are no longer in the same boat. Some even believe that we are in different boats, and our boats will have a head-on collision sometime down the way. And they have arguments to support such a belief. Some of them believe that because the US has failed to change China over the past decades, we are no longer in the same boat, and should not be in the same boat. We’ve all read articles like this, written by people who actually took a large part in the formulation of the US policy towards China. But I think this is an illusion. I don’t think that our two countries can really change each other as some have advocated. China has its own history, culture, and political and economic systems. Whatever has happened in China is an outcome of China’s long history. I don’t think that any country can really change China. And that shouldn’t be the policy goal of any country, including the US. I don’t think that was the goal of successive American Presidents over the past four decades. I talked with Dr. Henry Kissinger, and he said that was never his goal, or President Nixon’ goal, when they started to reopen relations with China. But there are people who believe that we are not in the same boat because China is a kind of “revisionist country”, trying to challenge international rules. This is not based on facts either. This year marks the 40th anniversary of China’s reform and opening up. Early next year will mark the 40th anniversary of diplomatic relations between China and the US. Look at the history of China over the past decades, and we can find that China has joined more and more international organizations, acceded to more and more international treaties and conventions, and accepted more and more international rules. For instance, some people are unhappy with China’s performance in the WTO. Actually it took us 15 years to join the WTO. We learned about its rules, adapted to them, and abided by them. It is fair to say that China’s record in the WTO is open, transparent, and faithful to our commitment to the organization. At the same time, maybe I am being very frank by saying that, if we take a look at the record of the US over these years, the US has taken a lot of initiatives to revise these rules, starting maybe with Nixon’s abandonment of the gold standard, which was a shock to the Bretton Woods institutions. Then some 20 yeas ago, there was a kind of theory that a country can engage in humanitarian interventions in violation of the sovereignty of states. More recently, you see the US withdraw from the Paris Agreement, Iranian nuclear deal, and UNESCO. Some even propose that the US should withdraw from the WTO. I don’t know whether this will happen and how far the US will go. If we look at all these historical records, maybe the name “revisionist country” is more suitable for the US than for China. Some people believe that the US and China are not in the same boat and should not be in the same boat, because as China develops, it will try to challenge the position of the US and its dominance in the world. But I don’t think this is a correct interpretation of China’s intention. Some people are worried about what China is saying, such as China entering a new era of development. Some are scared by the term “new era”. I have met with some very serious American scholars who asked me this question -- does China’s new era mean the end of the American era? I have full respect to those serious scholars, including Graham Allison, with whom I had long conversations. I think his book to a large extent has been misinterpreted. He was not advocating for the so-called Thucydides Trap. He was saying that we could avoid this trap. There are many misunderstandings and misinterpretations about China’s goals and intentions. What we mean by this new era is that China has entered a new stage of development, with the major challenge being to meet the people’s ever-growing needs for a better life and address unbalanced and inadequate development. Of course, China will have to develop itself in an open environment. We cannot close our door. But this new era is mainly for China’s own development, not for global dominance. There are people who believe that over the years of our relations, especially economic and trade relations, the US has got all losses, and China got all gains. This is, once again, not in line with realities. Our economic and trade relations are interdependent and mutually beneficial. We should not focus so much on the trade deficit, because there are a lot of structural reasons behind this deficit. Moreover, trade deficit does not mean all losses to the country that has deficit. And surplus does not mean all gains to the country that has surplus. I think you are better economists than me. If we look at the history of the global economy, we, the international community or the human race, have been able to generate much more wealth over the last 20 years or so. But at the same time, there are groups of people, not only in the US, but also in other countries, including China, whose lives are not better off, with some being even worse off. This is a real and serious challenge to all of us. But this is not an issue of foreign trade, but rather an issue of domestic economic and social policy, including the distribution of wealth. How can we take care of these vulnerable groups? It will not help anybody to put the blame on other countries or on foreign trade. For those arguments that we are in different boats, should ride in different boats, or even have a head-on collision, they are not supported by facts. It does not serve the good of anyone. Unfortunately, there are those who are trying to rock the boat. For instance, they are painting a distorting picture of our economic and trade relations. Some of them have even gone further by playing fire on issues of Taiwan and others that concern China’s territorial integrity. These are very dangerous developments. We have to be very careful about it. I still believe that our two countries remain in the same boat. The common challenge is to navigate this boat through the uncertainties or uncharted waters, for the benefits of both our countries, and for the entire world. Hopefully dialogues like what we have today will help the two governments to develop policies that are pragmatic, constructive, and beneficial for both countries.